Cromwell wears the Judgment set, which bears the description: "Honoring an ancient goddess. Sin was said to be her domain, but the name of this goddess is long forgotten. Little is known about what purpose the mask served, only that it was worn by a person of great authority." Cromwell is a pardoner of Velka, by now an ancient goddess whose name has been long forgotten. Like her name, it is likely that Velka’s practices have also been lost. The pardoners once wielded a symbolic blade and cast miracles with actual tufts of the goddesses’ hair used as a talisman, but Cromwell does not, nor does he hold a tuft of Velka’s hair. 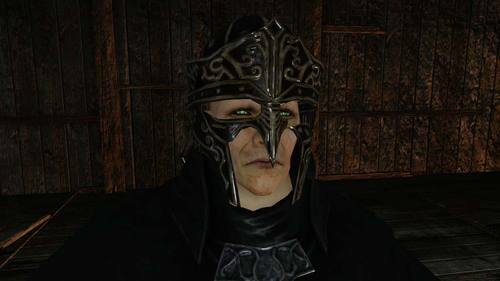 When Cromwell forgives a Player of their sins, it will make offended NPCs non-hostile, but will not remove any of your sin (which can only be done through being killed by the Blue Sentinels). These facts strongly indicate that Cromwell is an imposter to the service of Velka, though like his predecessors, he does listen to the confessions of sinners, and urge reflection and salvation. Cromwell’s presence in the old church at Brightstone Cove Tseldora is near inexplicable, but a number of origin stories can be theorized. It may be that the church he resides in was one built for the worship of Velka. The people of Brightstone Cove Tseldora were certainly mired in sin and misdeeds, compelled to greed by an inexplicable and insatiable urge (though we know it was the influence of the Old Paledrake Soul). This may have led the people to seek relief from their sins, and allowed the rise of one who had read about or discovered remnants of Velka’s clerical order. It may be that Cromwell was a cleric dispatched to Tseldora with the Drangleic Royal Army to combat the spiders that had overrun the town. He sells us the white priest set, a set made for a male in the Drangleic priestly order. So it may be that in Tseldora, a place that likely contained riches and relics of old, Cromwell discovered Velka’s black clerical set, donned it and became “the pardoner”. Finally, Cromwell may have come from Lindelt, a land rich in miracles. He sells one miracle that can only be gained from him: Perseverance. The description of perseverance explains that Lindelt ascetics are sent to distant lands for proselytizing and self-training, but many of them decide not to return. This miracle is one of 3 sets of items that Cromwell will give you that combat poison, bleed, curse (and petrify). He will sell the 3 bite rings, powerful rings made in Carim (where Oswald the Pardoner was from), Perseverance, a Lindelt miracle and he will give you the Ring of Resistance, a ring made by Straid of Olaphis. While possibly a necessity for gameplay, it is interesting that all 3 of these item (sets) are unique to Cromwell. Cromwell could certainly be described as ascetic, living by himself in an abandoned church attic above a cove filled with inhuman beasts and terrible misdeeds, and he has a strong connection with miracles which Lindelt is well known for. So it may have been that Cromwell established himself as pardoner in Drangleic after finally freeing himself of the stringent laws of Lindelt. Like Oswald of Carim, Cromwell has connotations associated with the Dark. He will sell the Scraps of Life spell which is described as esoteric, only known by a small number of people interested in such things. Where he stands in the attic, he is surrounded by completely hollowed bodies that appear to represent these “scraps of life”. Cromwell may have a checkered past himself, as his only talk option dialogue explains that “anyone can be forgiven, as long as he is sincere, no matter how terrible the sin.” This line seems to read from personal experience, as he says as long as “he” is sincere and may indicate Cromwell himself found forgiveness for crimes committed. Alternatively, it may just be a line well practiced to convince you to give him souls in exchange for a phony forgiveness. "Something seems to be bothering you. Yes, yes, I can tell. It is written upon your face. You have doubts, about something you did. Regret, anguish, disillusion, bewilderment. What wonderful gifts they are. Together, they are the essence of life. Don't you agree?" "But now, you are lost, bewildered by your own actions. Yes, yes, how tiny and frail are we. But if your heart is yet sincere, your sins will be forgiven. Now is the chance. Demonstrate your sincerity to me." "Ask that your sins be forgiven." "I, Cromwell, will pardon your sins." "We must never forget our sins." "You will always find me here." "You seek indulgence? Then tell me of your transgression." Yes: "…Your sin has been forgiven. May your contrition be sincere and enduring." No: "Then, you wish to stand and face your own sins? Such virtuous fortitude is rare, and I sincerely commend it." "Anyone can be forgiven, as long as he is sincere. No matter how terrible the sin. Surely, we all deserve mercy, yes." We all deserve mercy, every last one of us." "You are a cold beast." Robe honoring an ancient goddess. Sin was said to be her domain, but the name of this goddess is long forgotten. Little is known about what purpose the mask served, only that it was worn by a person of great authority.